Acetone: Because your tee's print is paint, and acetone is paint thinner, it fades everything when applied via a soaked sponge and dabbed/ lightly scrubbed against the areas you want affected. Ink run's possible, though, so put cardboard inside the tee before starting and wash immediately should bleeding occur, although by that point Arnold will have already realized that he can kill your t-shirt. 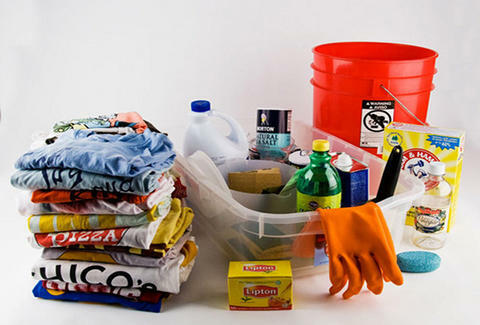 Salt & Washing Soda: After the acetone-in', wash your shirt in a combo of 1/4c washing soda and 2c sea salt to fade bright colors. As salt's an abrasive, it'll also lend the tee softness that increases when repeated, which you've explained to your girlfriend is exactly why you need a rest period. Sandpaper: Tack fine-grit sandpaper to a hard surface and rub your shirt against it; it's perfect for stressing heavier plastisol prints, and adding lived-in stress to hems and seams, though you should scour gently so as not to make holes, because nobody needs another crappy movie about Shia LaBeouf digging in the dirt. Found Item'll continue to update the blog with new and creative aging methods, potentially including a buckshot wash, stone drying, and other heavy-duty moves, or what Val Kilmer calls "moves".